Confession time – I like to knock things over. If someone is building a house of playing cards, I like to create a slight wind and watch it fall to the ground. Trying to see how high you can stack items? Don’t do it around me! And I won’t even mention how you shouldn’t attempt to create a domino line if I’m anywhere in the area. I WILL throw something from across the room and laugh as all your hard work tumbles, one domino at a time. Yeah, I have a problem. 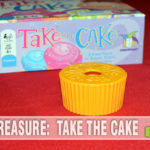 We recently found a solution for this mischievous behavior in the form of a game! 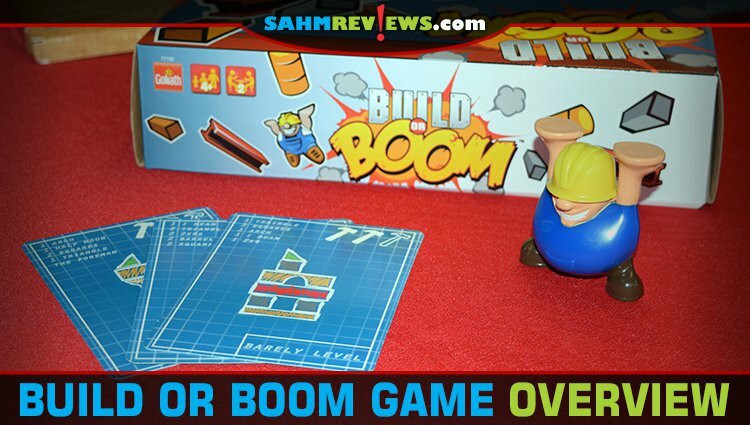 Build or Boom by Goliath Games challenges us to build our own custom construction and rewards us by giving permission to blow up the other person’s creation! In the box are a number of large plastic I-beams, barrels, cement blocks, pylons, crates and more. Everything you’d expect to find at a construction site. More importantly are two building platforms connected by a hose to rubber sticks of dynamite! 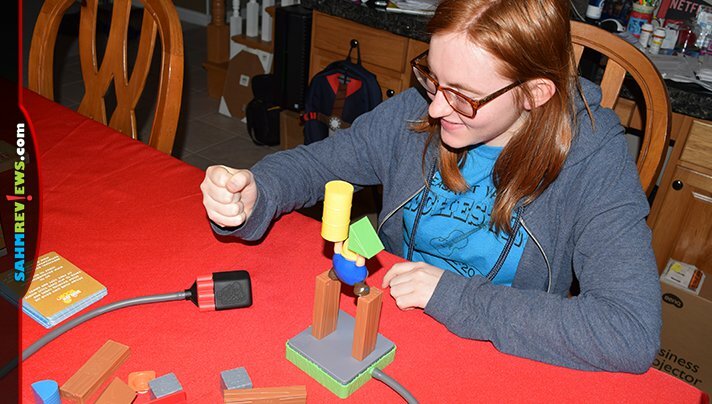 This is where you’ll be building your contraption and how your opponent will blow it to smithereens! 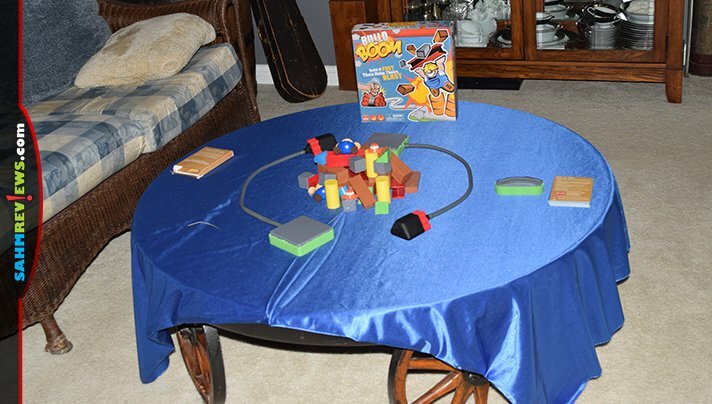 Each player takes one of the platforms and makes sure the dynamite reaches across the table to the other person. 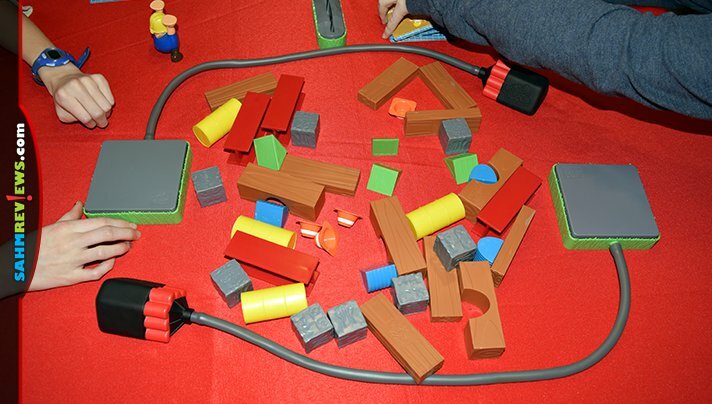 All of the plastic building pieces are placed in the center of the play area. The deck of construction cards are shuffled, one card is drawn and put inside the custom card holder. Each card displays the same thing on both sides and it (and the holder) should be positioned between the two players so each may see the blueprint easily. On the count of three, each contractor will rush to build the exact building depicted on the construction card. There are varying levels of difficulty, represented by one, two or three hammers at the top of the card. The materials needed are listed on the card and depicted in the order they must be placed on your platform. It’s a all-out rush to be the first to finish their building! Once you have completed the plans, smash the Boomer (the dynamite) and watch your opponent’s structure leap into the air and fall to the ground. 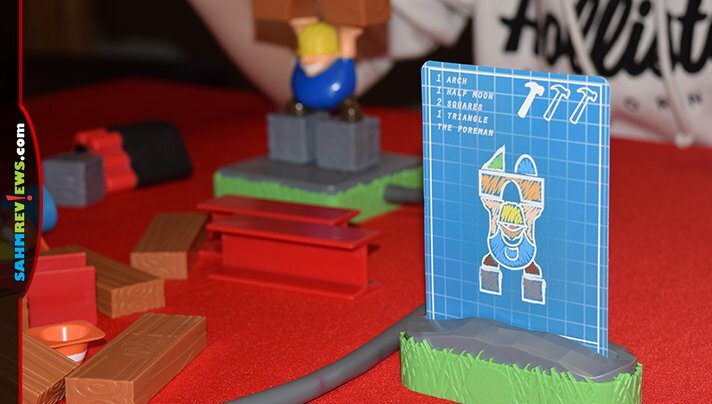 If your tower matches the construction card exactly, score one point for yourself! 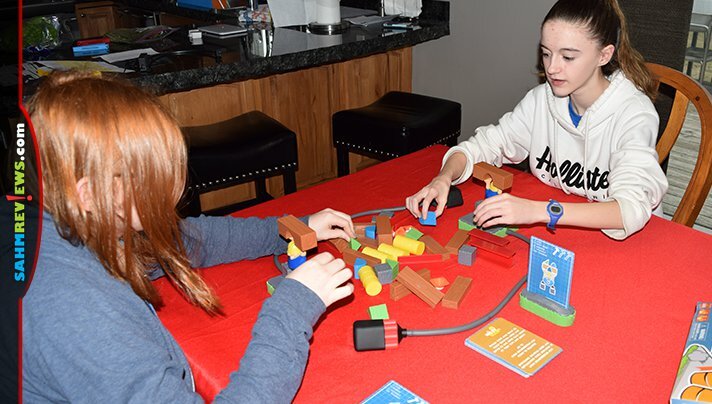 To prevent cheating, we added the house rule that you lose a point if you built incorrectly and destroyed the opponent’s building without yours being correct. All pieces are reset to the center of the table, a new card is drawn and the next plan is constructed! The first player to score 10 total points wins Build or Boom! I would argue that because we get to destroy multiple building in the game that we are all winners! 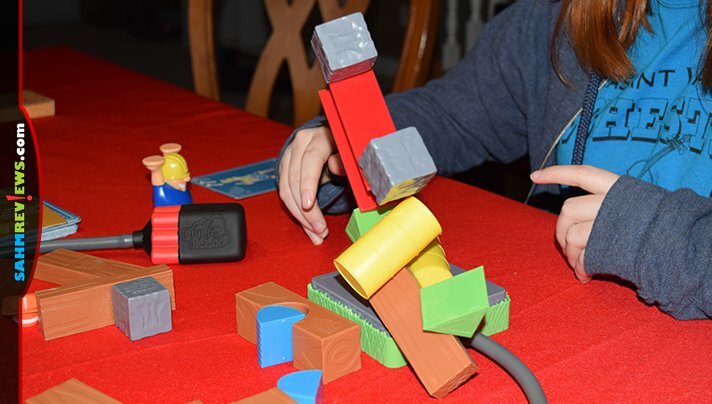 Currently available on Amazon for under $20 ($30 MSRP) and with very good reviews, Build or Boom is perfect for all ages (4+). I’m not the only one who likes knocking things down – I’m just among the few that will admit it! 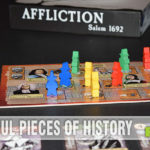 If you head over to Goliath Games’ website, you’ll see a number of new releases that are all family friendly and perfect for a birthday or holiday gift. But if you really want to see what’s blowing up, follow them on Facebook or Twitter!